A deep dig into recent home purchase loans shows that some of the underwriting standards employed by FHA and the GSEs (Fannie Mae and Freddie Mac) eased over the year that ended with Q2 2018. Archana Pradhan, an analyst with CoreLogic's Mortgage Finance and Risk Management Department writes in the company's Insights blog that neither conventional nor FHA lending extended the easing to their respective treatment of credit scores. CoreLogic looked at the three key factors in mortgage underwriting, debt-to-income (DTI) and loan-to-value (LTV) ratios along with credit scores. The analysis included average scores and ratios, but Pradhan says that measure does not necessary indicate any higher risk to the housing market, so the company included an analysis of the trends in the share of loans originated using the relaxed standards. Loans with DTI ratios above 45 percent peaked pre-crisis at around a 35 percent share for both GSE and FHA lending. The GSE share peaked and was headed down before the housing crash started, crossing FHA as its shares were still rising. Throughout the housing crisis FHA shares of loans with DTIs over 45 percent never fell below one-fifth of the total while the GSE share was in the 5 to 7 percent range. In July 2017 Fannie Mae raised its maximum DTI from 45 percent to 50 percent. The average DTI ratio had been rising steadily since mid-2013, but took off after that change, rising 2 percentage points from the second quarter of 2017 to almost 37 percent by the same quarter this year. The average DTI for FHA loans started to rise after Q2 2015 and by the second quarter of this year had risen to 43 percent, its highest level in at least 14 years. 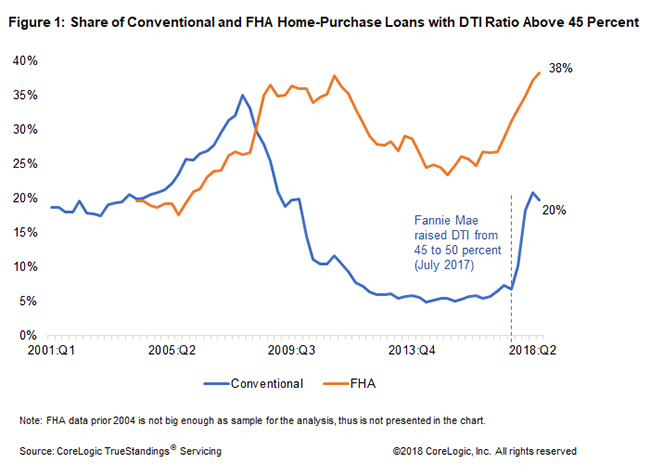 Not surprisingly, as shown in Figure 1, the share of loans with high DTI ratio loans appears to have been triggered for both GSE and FHA lending by Fannie Mae's action. The changes in LTV ratios over time have not been as dramatic as those for DTI. 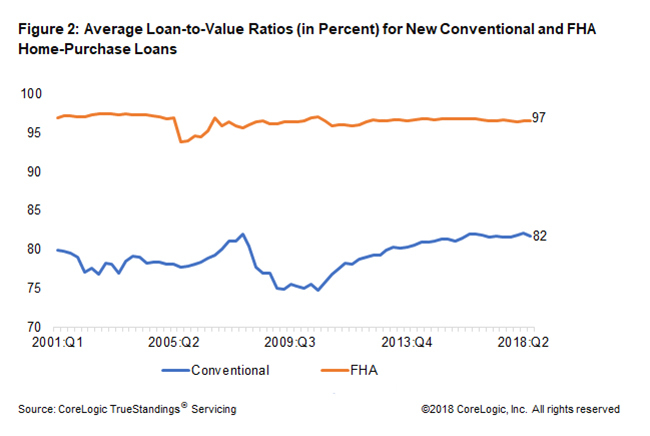 For FHA purchase loans the average LTV has remained steady at around 96-97 percent for more than a decade while for conventional loans the average rose steadily from about 76 percent in the second quarter of 2010 to 82 percent in the same quarter of 2018 but there was little change for either loan type between 2017 and 2018. Both GSEs started buying loans with less than 5 percent downpayment in early 2015 and their share of these high LTV loans started rising almost immediately from less than 2 percent in 2014 to 9 percent in the second quarter of 2018. In contrast, the share of FHA loans with LTV ratio above 95 percent has remained steady at around 87-89 percent in last couple of years. Consistent with its mission FHA has always had lower lending standards that the GSEs and still do for average credit scores. The average score of its borrowers has declined steadily since the second quarter of 2011, from 709 at that point to 681 this year. For conventional borrowers the average credit score has been more consistent, remaining in the range of 758-763 since 2009. Looking at the high-risk tail, the share of borrowers with a credit score less than 640 is just 1 percent for conventional loans compared with 18 percent for FHA loans originated in Q2 2018. Pradhan concludes that although both the DTI and LTV standards have been relaxed since 2015, credit score standards have not been eased. 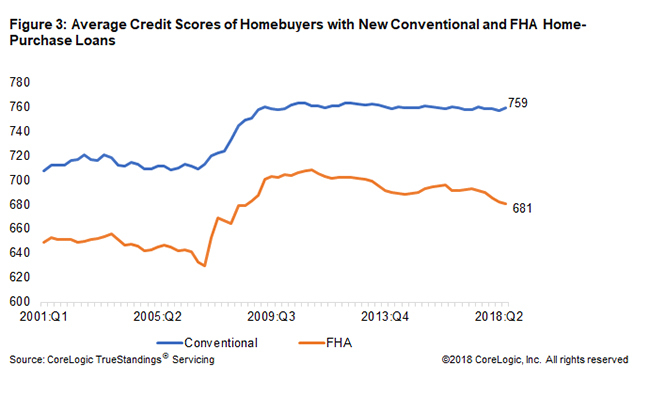 "In fact, the average credit scores for both FHA and conventional loans were much higher in Q2 2018 than the pre-crises level," she says. "High credit score standards and full documentation help offset the added risk from high LTV/DTI loans in Q2 2018."